You don't have to pull stickers off our produce. We know what it is; you know where it came from. Ours is a family farm committed to farming on a human scale. Cool weather has delayed the beginning of sugaring. Tapping will take place at the end of the first week of March. Sugaring will then continue through the remainder of the month. The Yoder Farm is fortunate to be the site for one (Eel River Valley-Yoder) of thirteen Indiana stations in the Shallow Geothermal Monitoring Network maintained by the Indiana Geological Survey . The station is adjacent to one of our asparagus fields. This makes it possible for everyone to have access to accurate and timely information about soil and atmospheric conditions. 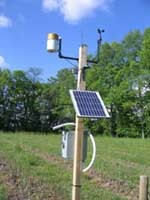 You can monitor current soil temperatures and weather conditions at the farm at the IGS's web site..